The Marx Brothers were sui generis. It’s remarkable that one family could have produced four (actually 5; Gummo stopped performing early on) such funny, talented guys who operated, on stage and screen, as one wacky comedic organism. Trying to recreate that inspired insanity is a formidable task. In 1930, when they made their 1928 Broadway hit into a film, “Animal Crackers” revealed their madcap irreverence and spontaneity, their iconic verbal and physical humor. Sometimes, they just seemed to be pranking and entertaining each other. In the 2009 revised version of the George S. Kaufman and Morrie Ryskind musical, adapted by Henry Wishcamper, the large cast is reduced to nine actors playing multiple roles and the orchestra is scaled down to six musicians, some playing multiple instruments. The lightning-quick changes are among the most amusing elements of the Cygnet Theatre production. The antics of the brothers (as in the song, “Four of the Three Musketeers”) capture the true collaborative all-for-one spirit. The delicious opportunities for Groucho (the talented Josh Odsess-Rubin) to ad lib and interact with the audience are hilarious. But the show itself is a mishmash. It’s not really sure what it wants to be: a screwball comedy, a romantic comedy (with multiple romances, some easier to follow and care about than others), a vaudeville pastiche or just a zany vehicle to showcase the comic craziness of the Marx Brothers (with a convoluted plot wrapped around them). It tries to be all of these, and winds up succeeding wholly at none. There are too many love ballads and not enough character depth to maintain audience attention or concern. Class and cultural/religious distinctions in Jazz Age Long Island are hinted at but not fleshed out. At a posh party, one guest brings a famous painting to unveil. It goes missing, and it turns out that there are two fakes floating around, for various reasons. Harpo (agile, antic Samantha Wynn Greenstone) constantly runs (honks?) after women, though it was actually the aptly named Chico — pronounced Chick-o, who was the real-life inveterate skirt-chaser). Spencer Rowe is delightful in that role, with the pseudo-Italian accent (developed early on by Chico to deal with the tough-guys in their New York neighborhood). Bryan Banville, quite good as other characters, doesn’t distinguish himself much as Zeppo, who generally played the romantic straight-man. It’s Groucho, of course, who out-talks and makes sport of everyone (including himself) and puns mercilessly (“That’s a groaner,” he tells the audience conspiratorially. And “They can’t all be funny, folks!”). On the way out of the theater, I heard a few people complaining that they missed a lot because it went by too fast. But there are, in fact, so many slow spots (and it goes on for nearly 3 hours) that I honestly wished the pace had been a lot faster. Director Sean Murray achieved the perfect pacing for the similarly screwball “On the 20th Century,” but this show still needs to find its legs, somehow. No fault of the cast; they’re uniformly excellent and infinitely flexible. In the case of two of the women (Amy Perkins and Lauren King Thompson, both delectable), I wasn’t always sure who was playing whom when they shifted characters. 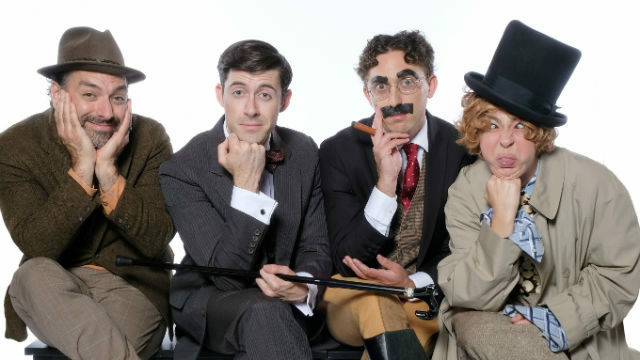 The choreography (by Russell Garett, who also plays Hives, the officious butler, as well as the grandstanding millionaire art-collector Roscoe W. Chandler) is often clever and is generally well executed. The singing is mostly first-rate, except for a few times when the “family” foursome hit some clunkers. The costumes (by Jennifer Brawn Gittings) range from sumptuous to humorous. The lighting (Kyle Montgomery) is fine, but there were sound balance problems (design by Dylan Nielsen) at the outset on opening night. The wigs (ubiquitous Peter Herman) are fairly normal at first, and delightfully outrageous in the 18th century French dream sequence (a birdcage nestles in one foot-high Marie Antoinette hairdo). Perhaps best of all is the outstanding onstage, tuxedoed 6-piece orchestra, helmed by topnotch music director/pianist Terry O’Donnell; they really get into the spirit of the piece, responding and reacting repeatedly. The music and lyrics (by Bert Kalmas and Harry Ruby) are pleasant, but not as memorable or clever as they should be. And several of those romantic duets could easily be jettisoned and no one would notice. Better still, perhaps the musty musical should just be returned to the dustbin of history. All in all, the evening isn’t as funny or witty or wacky as it should be. It’s mostly a problem of the show, but that drags down (and drags out) the production.